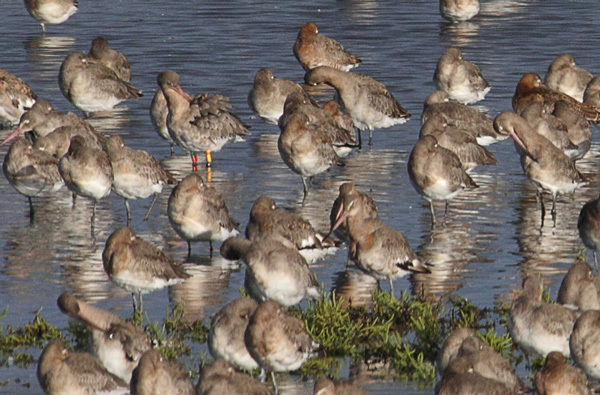 Spot the Colour Ringed Godwits! You might think that a godwit with all those coloured rings would be easy to see but finding a colour ringed godwit in the middle of a flock can be very difficult. To test your skills at finding colour ringed godwits and help you practice why not try clicking on any of the links below (Flock 1, Flock 2 etc.) and look through the flock and see if you can find a colour ringed bird. Some will be easy to find but some will be very difficult. There is one or more colour ringed godwits visible in each photo. You might be only able to see one ring of the four and the bird might be hiding in front of another. Sometimes the ring colour is reflected in the water where it is standing and this can give you a clue to its presence. You might not see the colour ringed bird by searching just once. It can take time and concentration to find a colour ringed godwit. If you are not sure what colours we use on the godwit project CLICK HERE to see them. When we look through a flock for colour rings if we have time we do it as many times as we can because some birds will be hidden behind other and you might just miss one the first time you look. When you click on the flock links below you can use the + and - sign in the top left hand corner of the image to zoom in and out and you can click and drag to move around the photo of the flock. You can make the image full screen by pressing the black button with the arrow in each corner just above the top right hand corner of the flock photo. Send us an email with your answers and we will let you know if you were right. Once you have tried all the flocks below you are ready to go out to the nearest godwit roost or feeding area and try and find a real one. Best of Luck!